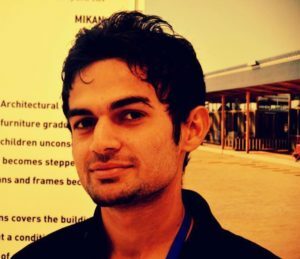 Ayaz Ahmad is a young Pakistani postmodernism architect. who designed many of the reality based projects during his study. 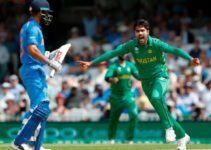 Ayaz ahmed was born on November 15 1992, narowal, Sialkot. he studied at comsats institute of information technology Islambad and designed many Buildable projects during his study. He adopted modernist and postmodernism in many of his design. His projects include the Bank design, Basic health unit, Defragmentaion of Casa Malaparte Building, Sustainable school design with hostels, Museum, Cultural Complex, Highrise Residential tower, and Recreational Tourist Resort. 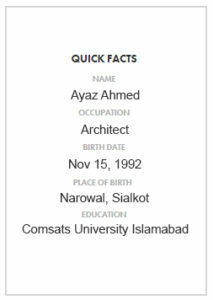 Born in Narowal on November 15, 1992, Ayaz Ahmed went on to attend the college of technology, where he earned a associate civil engineering degree, then attended university of COMSATS Islamabad and left with his bachelor’s in architecture. he spent his time immersed in the study of the region’s Ubquitous ancient structures.